Susan Blacker, et.al provided an excellent article “Advancing Hospice and Palliative Care Social Work Leadership in Interprofessional Education and Practice.” 1 The authors describe the importance of interprofessional collaboration in palliative care, and strategies to address barriers. Increasing curriculum and practice presence are essential to improving this effort. 3. increase the understanding of roles between CSW and nursing. Implementing this suggested strategy can have an immediate, long-lasting impact. As a palliative care clinician, I work with providers across the acute care system. I’m happy to see that there are more and more programs and efforts being made to help house staff and other physicians manage the emotional impact of our work 2. I spend a good portion of my day talking with nurses about our patients, teams, impact of care, ethical decisions, and more. Nurses at the bedside spend many hours with patients and families.They often become the most trusted partner in care, witnessing a variety of difficulties both physical and emotional 3. There is, however, surprisingly little emotional or educational support for processing this emotional impact of this charged work – aside from brief lunchtime banter. We know from research done with physicians that having structured, institutionally supported programs that addresses the potential burnout and compassion fatigue felt in medical practice are effective 2. How can we extend these programs n to nurses? There is no break in the day, no protected time: time set aside for a specific reason away from patient care. We must, therefore, follow one of the most basic foundations of CSW strategies--meet them where they are. 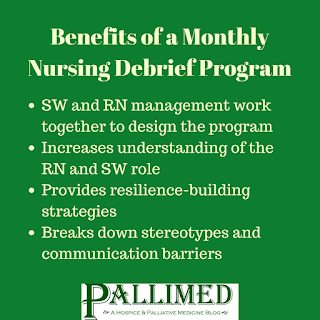 CSW facilitated debriefings for bedside nurses in acute care hospitals can be challenging in design primarily due to the protected time limitations; however, they can be immediately impactful on several levels. 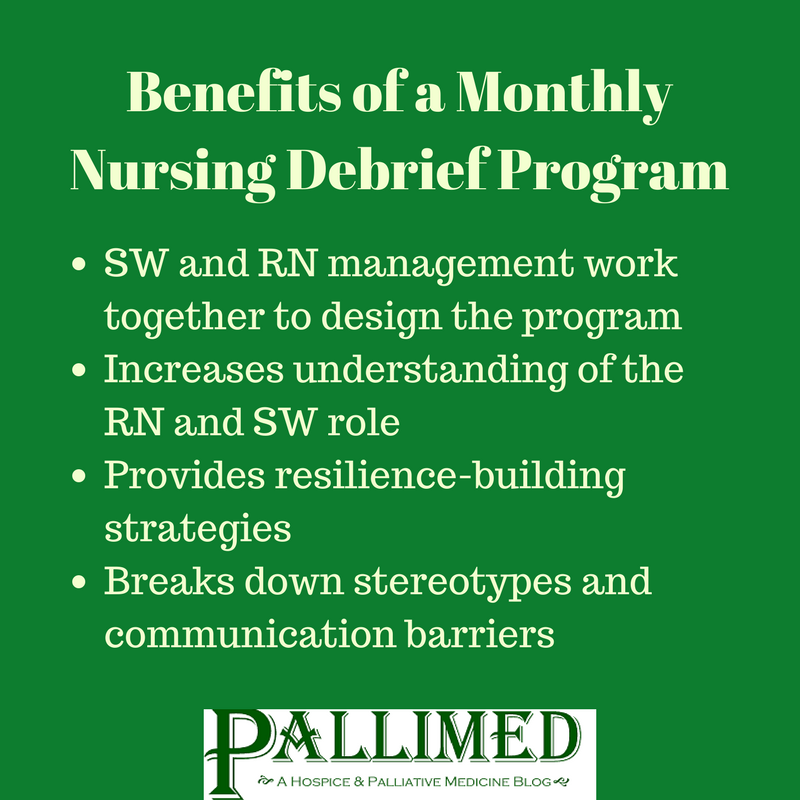 Providing monthly debriefings for nursing staff is one such strategy. A 30-45 minute facilitated opportunity allowing nurses to give voice to the difficult nature of the work they do and how it impacts them can be immediately impactful. “I was so upset when the transplant team dangled the carrot of transplant for this woman who is clearly dying." Led by a CSW familiar with the culture and the staff, these meetings are supported by the unit nurse manager. Meetings are open to all nurses on the unit, voluntary and confidential. Though this is not a support group, meeting are led consistently by a facilitator who is familiar with the unit culture. We schedule the debriefings for several months in advance, letting the staff know we are committed to the process, not waiting for an incident to happen. I would encourage clinical social workers in health care to take the initiative and offer the program– other providers don’t know we can do this. This is our expertise; it is what we do very well and it’s a wonderful opportunity for interprofessional development. We have been doing these at Duke Hospital for 3 years in a variety of settings: in-patient oncology, pulmonary step down unit, cardiac intensive care, medical intensive care, general surgery, pediatric ICU and more. Each has its own cultural barriers and openings. Use your clinical skills to tailor your approach for success. We can learn so much from each other. 1. Blacker SH, Barbara. Advancing Hospice and Palliative Care Social Work Leadership in Interprofessional Education and Practice. Journal of Social Work in End of Life & Palliative Care. 2016;12(4):316-330. 2. Back AL, Steinhauser KE, Kamal AH, Jackson VA. Building Resilience for Palliative Care Clinicians: An Approach to Burnout Prevention Based on Individual Skills and Workplace Factors. J Pain Symptom Manage. 2016. 3. Boyle D. Countering Compassion Fatigue: A Requisite Nursing Agenda. Online J Issues Nurs. 2011;16(1).